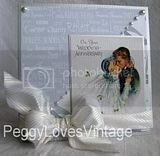 I have wonderfully talented designers who create projects from my Vintage Greeting Card Images. So, if you need ideas or if you are just looking for help on how to do something, check out their blogs. I'm sure they'd be more than happy to give you a helping hand. Take a minute and visit her blog and her store, I'm sure she'd be glad to see you. Meet Donna a wonderful individual who loves her hubby, her cats and her crafting. "I've always loved crafting, even as a little girl. My inspiration was my Daddy who was a wonderful artist and made beautiful 3-D Valentines for my teachers in grade school. Although I love all kinds of crafts I haven't had a real focus since abandoning counted cross stitch back in the 80's. Until I got my Cricut that is. Now I'm a blissfully retired card maker and papercrafter married 35 years to a wonderful guy with two furbabies, Goliath and Jezebel. Everyday I look forward to dreaming up designs and playing in my craft room. I invite you to share in my adventures.. "
Take a minute and visit her blog, I'm sure she'd be glad to see you. Heather loves to take pictures of her children and creates wonderful scrapbook layouts to display them. She is an avid card maker and crafter.